Although it may seem like your electricity use is being reduced when using a demand controller, in fact the amount is generally not aff ected. Demand control isn’t about how much electricity is used, but rather when it is used. The best analogy we’ve come up with is thinking of a demand controller as the cruise control for your building’s electric use. You set the limit of how “fast” you are willing to use electricity, and the demand controller ensures that your building’s energy use stays below that limit. The same amount of fuel (electricity) is used to get to your destination, but what increases the efficiency is the speed at which it’s being consumed. When a demand controller is installed to control non-essential electric loads, a demand limit is set. 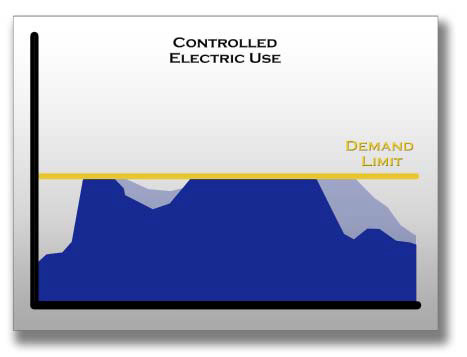 The area above the demand limit is then redistributed to time periods of less electric use. Essentially you are “cutting off the peaks and filling in the valleys.” The same amount of total electricity is still being used, but is spread out over a greater time range to lower the peak demand. If we were to go back to our cruise control example, the use of a demand controller helps maintain a steady speed of electric use versus the erratic speed that an uncontrolled building may experience. In the winter, a company might start heating their building very early in the morning around 5:00am. Therefore, when employees start arriving at 8:00am and turn on various electric loads the heat system can be cycled on and off while maintaining the comfort of the already heated building. This will help prevent a high spike in peak demand, thus reducing the demand charge. Energy is used more efficiently because the building isn’t forced to operate several loads (such as heating and operating loads) at the same time. 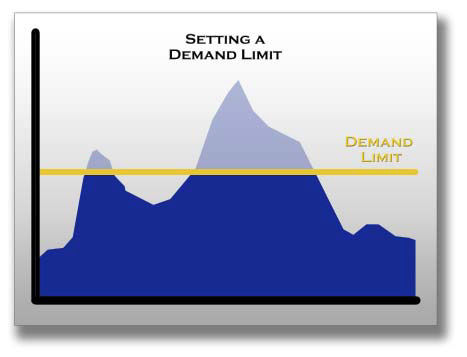 Why use demand control to level out your peaks and valleys? Because it saves you money! Most utilities divide electric use into 15-minute intervals. The meter records the kWh use for each of those 15-minute intervals. The interval with the highest 15-minute usage (in that billing period) sets the peak demand for that month. Not only does peak demand determine monthly demand charges on your electric bill, but it also determines which rate class you are placed on. Depending on the utility, some rate classes charge more per kW than others. A demand controller lowers your peak demand, thus lowering your demand charges, and many times can be used to drop to a diff erent rate class to save you even more money. A demand controller does not reduce the amount of electricity you use, but instead disperses the amount over a greater time period. 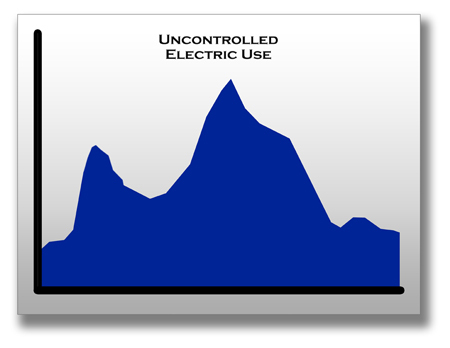 By redistributing your electric use (cutting the peaks and filling in the valleys)energy is used more efficiently. Previous Article:Serving up Demand Savings!